How Did God Lead Marianne to Social Justice? Today I have the pleasure of interviewing Marianne Jones, author, blogger, scriptwriter. Marianne didn’t let anything stop her from speaking out. Here is her story. I knew from the time I was ten I wanted to be a writer. I was an insatiable reader and loved to memorize poetry and write my own. When I was 14, I saw an ad for a national writing competition from a now-defunct magazine called Miss Chatelaine. I decided to enter, as a test, to see if I had what it took. I was shocked when I actually won. It seemed like confirmation, but it also scared me, and because of my perfectionism and fear of failure, I didn’t do a lot of writing for a long time. In my twenties, married, with two children, I decided to try seriously to write, and took a Christian correspondence course in writing. I thought that I’d give writing one year, and if I hadn’t sold anything in that year, I’d give myself permission to quit. That year I sold an article to Woman’s Touch magazine (also defunct now, but I don’t think it had anything to do with my article) for $15. I felt that God had given me my answer. Still, it was not smooth sailing after that. I had years of tears, discouragement, rejection letters. But God wouldn’t let me go. Every time I was on the verge of quitting, I’d sell another piece. And I began writing for local newspapers, which taught me how to do interviews and brought in a small salary. I first heard about IJM (International Justice Mission) at church. Right away I was hooked. So often we look at things like human trafficking and think, “That’s awful, but what can I do about it?” Here was a Christian organization that was doing a great deal about it! The idea of writing a play about their work kept gnawing at me. I had written a play about the work of the Salvation Army in Thunder Bay, and it had done well. I ordered Gary Haugen’s book, “Terrify No More,” to get a sense of how they carry out their rescue operations, and used it as a model for a play that I wrote and directed at church. We had a fabulous cast and team, and raised $22,000 from that evening! I have been involved to a smaller extent with other things my husband Reg has spearheaded. He formed a committee at church to sponsor two Syrian refugee families and help settle them in Thunder Bay. Both families are doing very well, and have become good friends. They are eternally grateful to the committee and to our church. Reg has also formed a “Walking Together” group at church to explore ways in which we can partner with First Nations people and promote healing, and reconciliation. This has been an exciting venture in our city, with the Walking Together group growing and gaining traction and influence in the city and some northern communities. God has led all the way. When I was a young Christian, churches seemed to be mainly concerned about evangelism among people that were similar to themselves. Social justice was not considered to be the church’s work. That never felt right to me or Reg. Throughout the Bible, God talks about injustice and oppression. Jesus spoke of breaking chains and preaching good news to the poor. This is an exciting time, when we are seeing God lead in showing His love to refugees, slaves, and people trapped in poverty and addiction. His love is not just toward those of us who live in a comfortable middle-class bubble. I am thrilled at what God is doing! Several years ago I heard Linda Stewardson share her story at church. We were riveted as she told of being stabbed as a child by her stepfather, put into a garbage bag, and left to die. I approached her later about it, and she was willing to work with me on a manuscript. Later, I entered it in a publishing contest run by Word Alive Press with Women’s Journey of Faith, and it won! Linda has spoken to women in prison, girls in crisis, College classes for child and youth workers, and everywhere she is invited. People are always enthralled by her story of how God enabled her to overcome her past and thrive. She has appeared on 100 Huntley Street three times, and the Centre for Mental Health and Addiction awarded her the Courage to Come Back award. 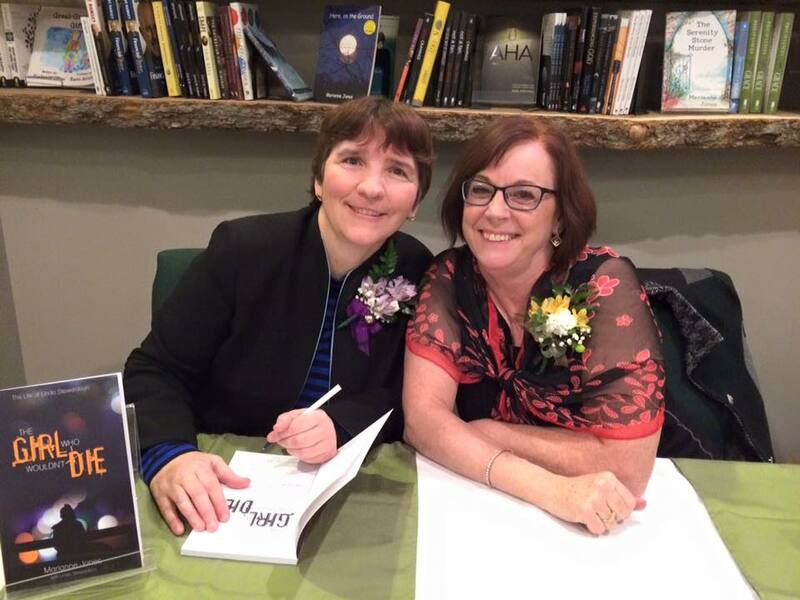 While Linda and I were signing copies at the launch of The Girl Who Wouldn’t Die at Women’s Journey of Faith in Saskatoon, a young woman stood near. She hung back. When there was a free moment, she came closer, hesitated, and then said, “Thank you for writing this.” Her eyes filled with tears, and she appeared to be struggling. “Does this story resonate with you?” I asked. She nodded, and managed to share that she, like Linda, had experienced severe abuse in her life. Linda and I both embraced her and tried to convey our sympathy. I asked her if she was getting support, and she said yes. She also said that often people didn’t want to hear about it. I told her that there is power in sharing one’s story. Watch it by clicking the link above. Someone else came with a book for signing, and I turned to them, as Linda continued to speak with the young woman. Unfortunately, we didn’t get any contact information from her to continue the conversation, but she has stayed in our hearts and prayers since. Linda and Marianne at book signing. People are often uncomfortable at topics like sexual abuse and human trafficking. They would rather change the subject and move on to something more pleasant. But I don’t see that as an option. How can we turn our backs on our sisters (and brothers) who, through no fault of their own, are treated as objects for abuse? I can handle the unpleasantness of the topic. I’ve heard women share their stories with me. Their stories don’t depress me. Rather, they motivate me to do something about it. Like everyone else, I have limited time, money and energy. But like the boy who gave his bread and fish to Jesus to be shared, I can give my small offerings of time and talent, trusting that God will multiply them. 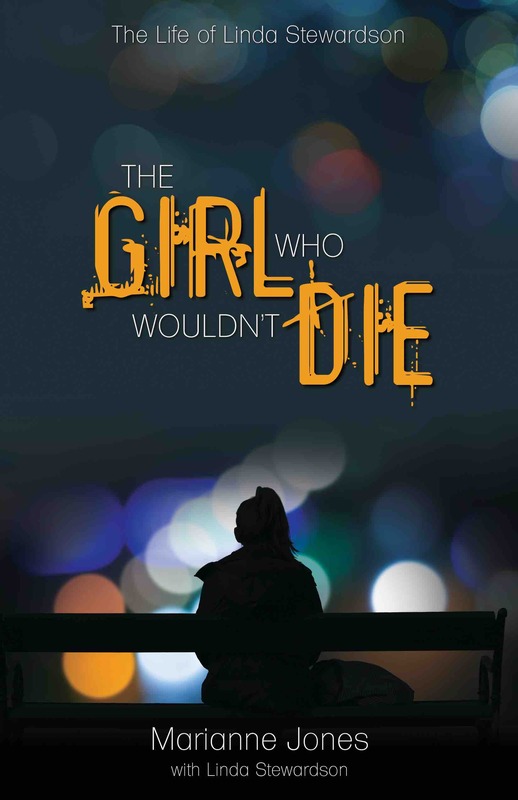 The Kindle version of The Girl Who Wouldn’t Die can be found here. Marianne is a team member for Chain Breakers at IJMCanada. Please consider donating to this worthy cause. This entry was posted in Cause, Guest Post, Interview, Prayer and tagged abuse, Bible, God, human dignity, human trafficking, IJMCanada, Linda Stewardson, Marianne Jones, The Girl who wouldn't Die on November 15, 2018 by JanisCox. Where Can You Find Me? I am not lost. I am not lost but found. At least anymore than a child of God is lost in this world. But I am found by Him – and that’s a hallelujah. And it’s time for revival. I believe strongly we need to all be praying for revival of the Holy Spirit. Join me at Artists and Writers Grow Through God’s Word Facebook Group. I am not posting as much here as I have begun to write seriously on another platform called Medium. I belong to a publication called Faith Hacking and one called Publishous. I also write in the member’s posts section. You can find me here and follow me on Medium – with no obligations. Revival There are many posts on this topic of revival. These are my most recent. If you follow me you will see more of my posts. This entry was posted in Prayer and tagged artists and writers, Facebook, found, lost, medium, revival on June 18, 2018 by JanisCox. Today is 5-Minute Friday and the prompt is SURRENDER. Five minutes to write… Set the timer. GO. As I surrender to God I ask Him to give me the words to write. I think back – to the year 2000. That’s when I did life mostly all by myself. I felt as if my stress level was huge. I felt burdened with the cares of this world. But the Lord turned me around and gave me this scripture that I have memorized from 1 Peter 5:7. That’s exactly what I needed to do. And I did. The pain went away. I slept well. I didn’t worry about much any more, because I knew – I really knew that God had it under control. To surrender takes work. It takes time. It takes trust. My life has changed. Yours can too. Surrender to God. Are you stressed? Do you feel as if you life is out of control? Do you want to be closer to Jesus? Do you need to surrender to Jesus? I’m working to help you. At the moment I have two ways to help you find the way to surrender to Him. I run a Facebook Group that is safe, and comfortable. It’s where we can grow closer to God; where we can study His Word. Join us. Growing Through God’s Word. There is an exciting opportunity for all believers to dig deeper into their faith. We will be studying David Kitz’s book, “The Soldier Who Killed a King”. Starting February 14. But for the next 6 days we are offering free books as well (for as long as they last). So join us. Book study With David Kitz and Janis Cox. Get up with God. Pray and connect. Go to bed with God. Pray and thank Him for the day. Pick up your Bible and read something. Then journal, draw and/or meditate on it throughout the day. Join somewhere with believers. I have given you 2 ideas. There are many more. If any one needs prayer, please feel free to contact me. (Email Janis). This entry was posted in Five Minute Friday, Prayer and tagged Connect, create, Creativity, David Kitz, groups, grow, Growing Through God's Word, stress, surrender, worry on January 26, 2018 by JanisCox. Christmas has come and gone but not the spirit of Christmas – that’s what should last all year. Today I drew my 33 dots again. This time I saw the stockings immediately. Although some people think that Santa shouldn’t be part of Christmas, I disagree. I think that the giving part of Santa should stay alive. As long as we don’t put “getting” before “giving” we will be okay. On the top of the mantel is the true meaning of Christmas, the Babe, Jesus, arrived in the flesh. The Incarnation. God with us. I love the story called “Santa’s Favorite Story”. Santa is worn out, but discovers that he can find happiness again in giving as he remembers the true meaning of Christmas. Simple but powerful. and ushers the giver into the presence of the great (Proverbs 18:16, NIV). You will be enriched in every way so that you can be generous on every occasion, and through us your generosity will result in thanksgiving to God (2 Corinthians 9:11, NIV). Let’s keep the giving alive at Christmas. But let’s put to rest the getting. Do you want to keep growing in your faith? Do you need a boost to study God’s Word? Growing Through God’s Word is an interactive Facebook Group that is a safe place to explore your faith without judgment. Learn to read your Bible and discover God’s Word. Learn to listen and hear God speak. JOIN US. We share. We learn. We create. We connect. We grow. 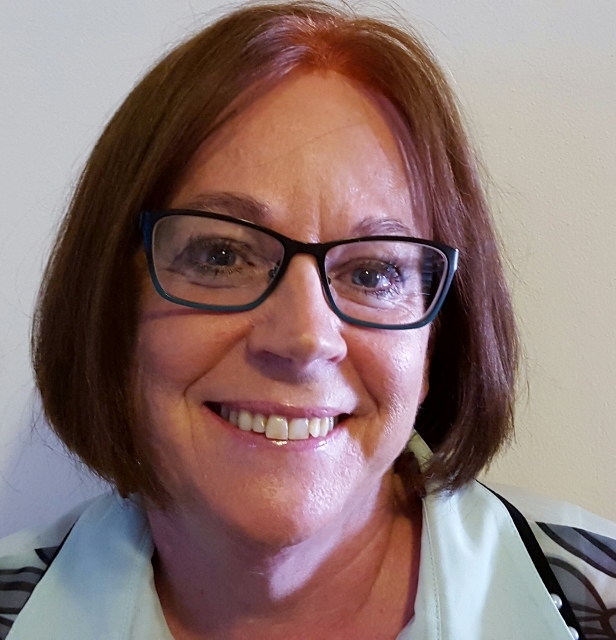 Janis is a creativity catalyst with a heart to connect people to God. She specializes in creating art based on Scripture so that the Truth penetrates hearts and not just minds.The world needs more pictures, art and colour. She also has a gift for you called One Word at a Time, if you like to work through scripture. This entry was posted in Prayer and tagged 33 dots, Christmas, creche, getting, giving, stockings, watercolor, watercolour on December 29, 2017 by JanisCox. Tomorrow is Remembrance day. We need to spend at least 2 minutes in silence listening to the Lord’s voice about this day. What are His thoughts? What does He want you to remember? Today is 5-minute Friday. The clock is set and I am ready to write for 5 minutes. 5-Minute Friday is the only time that I write directly into my computer. I always write in a notebook and then transfer my thoughts to my blog. So no editing.. I remember as a child having Remembrance Day services in our school. Very hushed. We filed in as quietly as we could and sat down. There were readings and some music (sometimes bagpipes). We were told about what war was and how and why our country fought for the freedom of all mankind. My Dad was a captain in the World War II. He landed on Juno Beach in the first wave across the sea. I can’t imagine the feeling – sea sickness, terror. My dad never felt sick. I believe he rested all his thoughts on Jesus. He went from one minute to the next. But he returned home. Found my Mom. Got married and had 2 daughters. He didn’t talk much about that day. But I am sure that silence was a welcome reprieve from all the gun fire. I believe that he found peace in that silence and knew God was there with them. God was there. Crying with them. Struggling with them. I always get teary eyed at this time of year. I remember all that those men did. I think of the wives, and mothers at home – waiting. The silence of waiting – not knowing. That must have been awful. But I do believe that God brought peace to those women. If He could bring peace to my Dad – then peace can be found in any situation. Do you take time to have silence before God? It is essential to finding peace. Try it. Timer went. Lots more to have said. But sometimes silence is better. Remember tomorrow to take a moment and be quiet before God for all those who served before and serve now for our freedom. As a child we recited In Flanders Fields by Major John McCrae. I can still say this from memory. Let us remember. Let us never forget. My pictures today are done in watercolour pencil crayons. I am taking a course in pencil crayons and need to buy some. But I tried it with watercolour pencils. My background was an old piece of watercolour – background, on 140 pound watercolour paper. It is not smooth. It’s supposed to be smooth for pencil crayons. But I learned a lot. Pencil crayons is all about LAYERS. More on that in another post. Here are the first 2 versions before I used the water on the last one. Have you tried pencil crayons? Which version of this poppy do you like? May you remember on November 11 to stop for 2 minutes of silence. Here are a few other posts about the Poppy. If you are looking for a way to connect with God creatively. If you are tired of scrolling through Facebook pages and getting nothing of value. Please join us at Growing Through God’s Word Private Facebook Group. This entry was posted in Five Minute Friday, Prayer and tagged Facebook group, In Flanders Fields, John McCrae, Remembrance Day, silence on November 10, 2017 by JanisCox. How Can Joining a Group help me reach God? Let’s make the Psalms come alive. I haven’t been posting here much as I have been posting on Medium.com. I am building a following there too. Also I have started a Facebook study group of Psalms Alive by David Kitz. I hope to keep you up-to-date here about what I am discovering. Discover more yourself by joining us at Growing Through God’s Word on Facebook. Ask to join. Mention this post. David has books available Please go here to find out more. Reading from the Prologue in his book, I found some wonderful nuggets of wisdom. David inspires us to ask the Holy Spirit to bring His Word to life. We find life in the Psalms, real people, and a relationship with God and His people. We will be reacting to what God is telling each of us -not what I say, because what God says to me could be entirely different to what He is telling you. Our expression will be through words, prayers, poems, songs, art, pottery, and relationships. An example of expression through art. Here is a short welcome video to the study to help you decide. This is a new way of communicating. I am taking the plunge and learning to video. Yikes. I have a lot to learn. But I am breaking away from fear – and branching into new territory. I feel like Moses when He saw the burning bush. I know God is calling me to do this. But I always say, “Who me, God?” Just as God gave Aaron to Moses, God has given me a new cheerleader, Deanne Welsh. She writes at Deanne Welsh at Unstoppable Writers. I am excited to see where this leads, willing to do the work. But I just need a push and support. Have you let the Psalms come alive for you? I pray that this email finds you well. If you ever are in need of a specific prayer, please email me. This entry was posted in Art & Scripture, Prayer and tagged Bible journaling, David Kitz, Facebook group, prayer, psalms alive, study on October 26, 2017 by JanisCox. This week’s prompt for #ScribblePicnic is “radio”. Actually it is too funny that this is today’s prompt. Last week I spent time at a Christian Writers’ Conference in Edmonton, Alberta. It is called Inscribe Writers’ Fellowship. What an amazing time I had! Look for changes coming in the next months. For “radio” I have an image of my sister and I listening to a radio program at lunch time before we headed back to school. The last word the broadcaster said was “Scoot”. And we did. I wanted to draw my radio but can’t find any pictures of it. In our town we have two radio stations – Moose and Canoe. I have been interviewed on Canoe a couple of times. A great way to talk to people in the town. But the best thing that ever happened to me about a radio was to be asked to be a podcaster for Hope Stream Radio. Ron Hughes the station manager trained me. And I was probably his most frustrated worker. Between technology, and sound; headsets, and uploading – I worked hard to figure this out. Patience is what Ron has. Thanks. Today I did my 101st program (not including special days or interviews). I hope you drop in to listen next week on Tuesday or go to my podcast page and listen to any of my recordings. People have asked, “What do you speak about?” My answer is anything and everything that is going on in my life. Sometimes it is a story I recall or something I have read in God’s Word. My podcast is called Growing Through God’s Word. This past week I also met a wonderful watercolour artist, Shelley Hitz, who taught a workshop on lettering. Today I am going to try that while doing my “radio” picture. So I looked at Hope Stream’s logo and then used a pencil, a Prismacolor Premier and a Pigma MB. I bought these at Curry’s on the way home from my conference. This is new to me. It is called faux calligraphy. Here is the result. You can look at the real Logo below. I am going to be trying more of this in the months to come. And I will be adding my watercolour as well. Here is one I tried using the new lettering and my Bible journalling. This entry was posted in Prayer and tagged #scribblepicnic, HopeStreamRadio, lettering, prompt, radio, Shelley Hitz, streaming on September 27, 2017 by JanisCox. The other day I read a post about being an active listener and how important it can be. I have a head that never stops thinking except when I am asleep. And I’m not sure about that either as I do have dreams. When I’m listening to someone I do try to keep eye contact and be fully engaged. The problem is that I can get so engaged with what been said that it brings to mind other ideas. And then I feel like I’m going to burst because I want to interact. I know I need to wait for the person to stop talking or at least a break in the conversation. But as you see this leads to not actively listening. If I wait until they are finished I will lose those thoughts. That shouldn’t bother me – but it does. I want to work on this part of me. I want to find a way of actively listening without interrupting. In church I take sermon notes. This helps me to relax, assured that if I have a question I can jot it down to ask the minister later. This whole thing made me think about my relationship with God and how I talk to Him. My prayers consist mostly of my talking. Period. That’s it. Could I sit still and really clear my mind of my thoughts and questions and wait for God to speak? The first time I tried this, years ago, I couldn’t sit still for longer than 5 minutes. After that time I became restless and uncomfortable. I have, over the years, become better at this. But lately I know I have once again reverted back to talk, talk and talk some more. I will instruct you and teach you in the way you should go. I will counsel you and watch over you. Oh my – yes that’s what’s been missing I thought. He says He will instruct, teach and counsel me. So for the first time in a long time I sat quietly before God. It took me a few uncomfortable, head-filled restless minutes, but eventually I relaxed and opened my heart and head to His Presence. I felt Him. I felt the peace of Jesus. I even had a few pictures in my mind too. But mostly I heard – You’ve come back. In my SIMPLE Method of Bible study the outline using these letters gives a time to pray and listen to God. If you want to know more about this method, Join my newsletter and get a free PDF. Father, we know we have very active minds that sometimes don’t want to shut down. Help us to learn how to clear our hearts and minds of the mental clatter to be able to hear from You. Give us time to be present with You. In Jesus’ name. Amen. Until next time, while you study a verse or passage take time to pray and listen to God’s voice. You will be inspired. You can listen to this devotional on my podcast for Hope Stream Radio. This entry was posted in Prayer and tagged active listening, Bible, communication, God, listening, prayer on September 4, 2017 by JanisCox. Don’t peel that birch bark! Don’t peel the birch bark! The prompt this week is curly. When we first think of curly we think of curly locks – Shirley Temple. But my mind went to our week at the cottage when the kids brought some pieces of birch bark over to the fire. Joining #ScribblePicnic with Michael. We explained that we do NOT take any bark from the tree as it will hurt the tree – it’s a protective covering and when it is taken off the plant hurts. It does burn very well even when wet. As a Canadian I value our birch trees. “Don’t peel the bark”. As a young girl this warning has stuck in my head. It takes 5 years for the tree to recover from being peeled. Instead peel the bark from dead birches, fallen branches, or peel that naturally falls to the ground. We would make canoes, teepees and many other crafts from fallen birch bark. 2 minute sketch of bark peeling off the birch tree. Final picture – very quick today as I am travelling once again. Here are a few interesting posts about birch trees. This entry was posted in Prayer, Scribble Picnic and tagged #scribblepicnic, art, birch bark, curly, prompt, tree, watercolour on August 30, 2017 by JanisCox. This week on Scribble Picnic the prompt is “flowerbed”. We are away on holidays so I did a quick sketch and watercolour pencils painting of a few of the flowers in our flowerbed before I left. This year our plants have suffered from so much rain. But still my garden grows. My vegetable garden isn’t doing as well. Beans and kale are great. But alas no tomatoes – way too wet. I’m joining Scribble Picnic today. Drop over to Michael’s blog to see other versions of “curtain”. This entry was posted in Prayer, Scribble Picnic and tagged #scribblepicnic, flowerbed, watercolour pencil on August 16, 2017 by JanisCox.